We are Estelle and Anthony, the French interns. We are both studying landscape engineering in the North of France in the College of Agriculture (ISA, Lille, France). Anthony is 26 and he works in a famous French landscape company as a site supervisor. Estelle is 23 and she works in a town planning company. She writes reports and technical documents about landscape and biodiversity integration for cities. 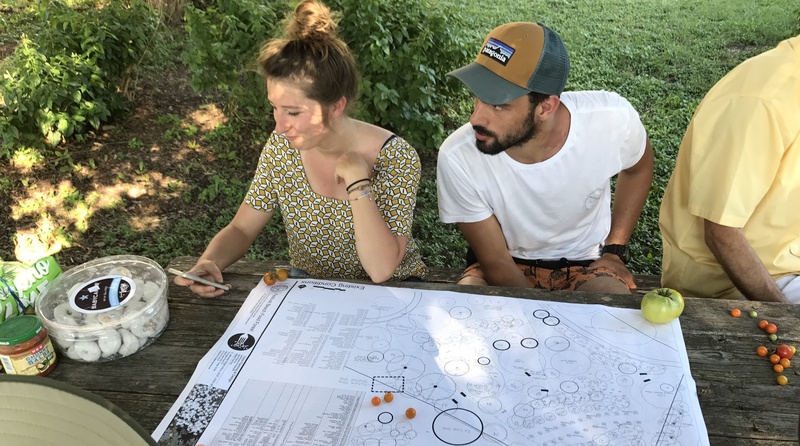 Our work will help move the design of the food forest forward. We are here until the 18th of August to finish the design of phase 1. Our main goal is to make propositions which correspond with the needs of users and the community. That’s why we will work together, we will meet some of you, and we will make sure that our design propositions meet the expectations and the vision of the whole project. Anthony: I am a gardener, drawer, and traveler. I come from Nantes, a city in the Middle West of France. It’s a region with a lot of castles, and the landscape is similar to the banks of the Colorado. After my degree in Environmental Landscaping, I lived 1 year in the Philippines, and I have traveled all over Asia. I like to discover other cultures and meet new people. During my travels I worked in many organic farm houses. I would like to use my knowledge for the Food Forest. The project of the Food Forest is the logical continuation of my life goal. I could not have a better internship. Estelle: I come from Lille, in the north of France but I grew up in Angers, in the west. I’ve always gone around the country for work and pleasure, and this passion for traveling has been proven with some experiences in Canada, United States and across Europe. I’ve always wanted to work in territorial development, and my environmental sensitivity made me think about landscaping and nature in general. As nature is moving on to an uncertain future, I consider this constant movement as a way to grasp landscaping nowadays. Having a professional project in urban renewal in France, I have a keen interest for the FBFF’s project. The way of thinking and the return to our roots with a food forest could be the guideline of what I want for my future, and for my home country.